"Hail Hydra #2" Limited Edition Giclee on Canvas by Adi Granov and Marvel Comics. Numbered Out of Only 10 Pieces and Hand Signed by Stan Lee (1922-2018). Includes Certificate of Authenticity.Custom Framed and Ready to Hang. "Ultimates #1" Limited Edition Giclee on Canvas by Kaare Andrews and Marvel Comics. Numbered and Hand Signed by Stan Lee (1922-2018). Includes Certificate of Authenticity. "Avengers: X-Sanction #1" Limited Edition Giclee on Canvas by Ed McGuinness and Marvel Comics. Numbered and Hand Signed by Stan Lee (1922-2018). Includes Certificate of Authenticity. 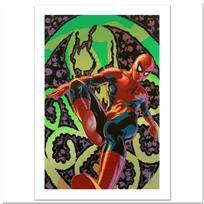 "Ultimate Spider-Man #126" Extremely Limited Edition Giclee on Canvas by Stuart Immonen and Marvel Comics. Numbered Out of Only 4 Pieces and Hand Signed by Stan Lee (1922-2018). Includes Certificate of Authenticity. Custom Framed and Ready to Hang. 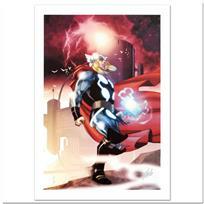 "Thor #615" Ltd Ed Giclee on Canvas by Joe Quesada and Marvel Comics. Numbered and Hand Signed by Stan Lee (1922-2018). Includes Certificate of Authenticity. "Ultimate Fantastic Four #26" Extremely Limited Edition Giclee on Canvas (31.5" x 42.5") by Greg Land and Marvel Comics. Numbered Out of Only 4 Pieces and Hand Signed by Stan Lee (1922-2018). Includes Certificate of Authenticity. Custom Framed and Ready to Hang. "Secret Invasion #7" Limited Edition Giclee on Canvas by Leinil Francis Yu and Marvel Comics. Numbered and Hand Signed by Stan Lee (1922-2018). Includes Certificate of Authenticity. "Captain America: Hail Hydra #3" Extremely Limited Edition Giclee on Canvas (28" x 39") by Adi Granov and Marvel Comics. Numbered Out of Only 4 Pieces and Hand Signed by Stan Lee (1922-2018). Includes Certificate of Authenticity. Custom Framed and Ready to Hang. 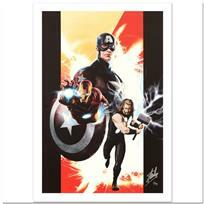 "Avengers #99 Annual" Extremely Limited Edition Giclee on Canvas by Leonardo Manco and Marvel Comics. Numbered Out of Only 10 Pieces and Hand Signed by Stan Lee (1922-2018). Includes Certificate of Authenticity. Custom Framed and Ready to Hang. "Free Comic Book Day 2009 Avengers #1" Limited Edition Giclee on Canvas by Jim Cheung and Marvel Comics. Numbered and Hand Signed by Stan Lee (1922-2018). Includes Certificate of Authenticity. "Fallen Son: Death of Captain America #5" Extremely Limited Edition Giclee on Canvas by John Cassaday and Marvel Comics. Numbered Out of Only 10 Pieces and Hand Signed by Stan Lee (1922-2018). Includes Certificate of Authenticity. Custom Framed and Ready to Hang. "Amazing Spider-Man #524" Limited Edition Giclee on Canvas by Mike Deodato Jr., and Marvel Comics. Numbered and Hand Signed by Stan Lee (1922-2018). Includes Certificate of Authenticity. 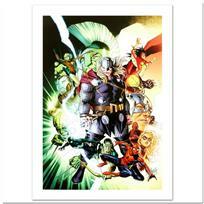 "Avengers: The Children's Crusade #2" Limited Edition Giclee on Canvas by Jim Cheung and Marvel Comics. Numbered and Hand Signed by Stan Lee (1922-2018). Includes Certificate of Authenticity. 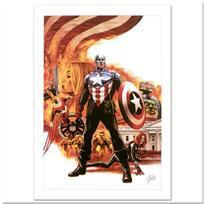 "Captain America #41" Limited Edition Giclee on Canvas by Steve Epting and Marvel Comics. Numbered and Hand Signed by Stan Lee (1922-2018). Includes Certificate of Authenticity. "Thor: First Thunder #5" Extremely Limited Edition Giclee on Canvas (29" x 40") by Jay Anacleto and Marvel Comics. Numbered Out of Only 4 Pieces and Hand Signed by Stan Lee (1922-2018). Includes Certificate of Authenticity. Custom Framed and Ready to Hang. "Marvel Adventures: Super Heroes #3" Extremely Limited Edition Giclee on Canvas (28" x 39") by Roger Cruz and Marvel Comics. Numbered Out of Only 4 Pieces and Hand Signed by Stan Lee (1922-2018). Includes Certificate of Authenticity. Custom Framed and Ready to Hang. "X-Men vs. Agents of Atlas #2" Limited Edition Giclee on Canvas (36" x 29") by Carlo Pagulayan and Marvel Comics. Numbered Out of Only 4 Pieces and Hand Signed by Stan Lee (1922-2018). Includes Certificate of Authenticity. Custom Framed and Ready to Hang. "Spider-Man & The Secret Wars #3" Extremely Limited Edition Giclee on Canvas (28" x 39") by Patrick Scherberger and Marvel Comics. Numbered Out of Only 4 Pieces and Hand Signed by Stan Lee (1922-2018). Includes Certificate of Authenticity. Custom Framed and Ready to Hang. 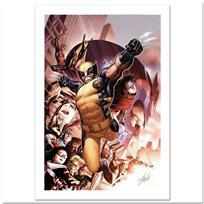 "Wolverine: Origins #34" Extremely Limited Edition Giclee on Canvas by Doug Braithwaite and Marvel Comics. Numbered Out of Only 10 Pieces and Hand Signed by Stan Lee (1922-2018). Includes Certificate of Authenticity. Custom Framed and Ready to Hang.